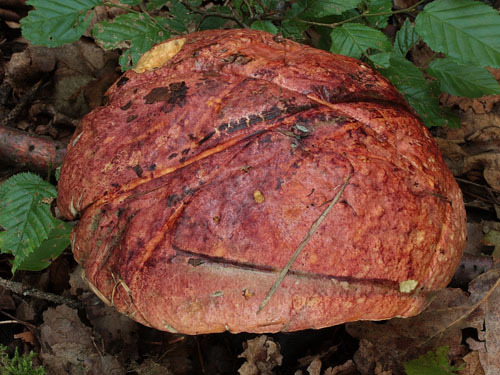 Cap up to 12 cm, at first hemispherical, later convex to flat-convex or almost flat, initially finely velvety, then smooth, dingy pink, pink, dark pink pinkish red or pinkish vinaceous, when young sometimes yellow with pinkish tint or entirely yellow; cap surface blueing when bruised. 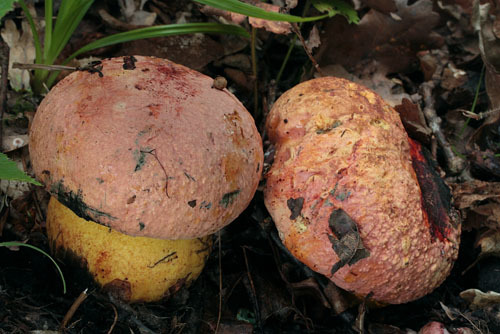 Stipe club-shaped, swollen at the base or cylindrical, in the uppermost part bright to dark yellow, downwards usually orange red to red or pinkish red, sometimes entirely pink, with fine orange red or red network, in the lower part often with fine red or pinkish red granules, stipe surface blueing when handled. 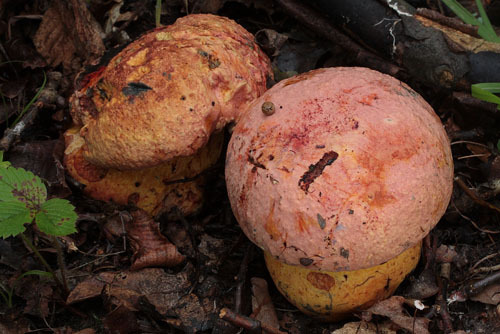 Flesh pale yellow, sometimes with reddish spots in the stipe base, blueing when exposed to air. Tubes yellow, blueing when injured. 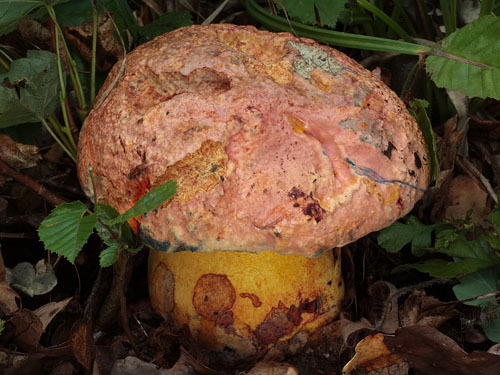 Pores red to orange, blueing when bruised. Smell not dsitinctive. Taste slightly acid. Spores 10.5–15 × 4.5–7 μm, ratio 1.9–2.7. Pileipellis trichodermium of interwoven septate hyphae of cylindrical, finely incrusted cells. Chemical reactions: hyphae of the flesh in the stipe base amyloid with Melzer’s solution. Habitat. Warm broadleaf forests, mycorrhizal with oaks (Quercus) or beech (Fagus). Similarity. 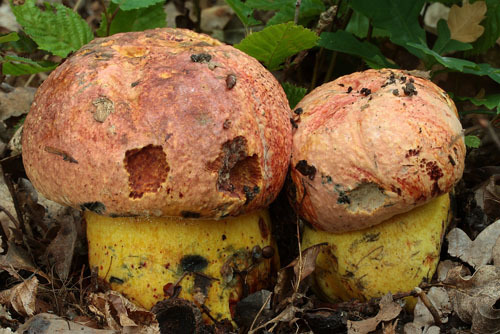 Boletus rubrosanguineus and Boletus legaliae are very similar, but the first one is found under conifers and the cap of those two species is unchanging when bruised, compared to the strongly blueing cap of B. rhodopurpureus. 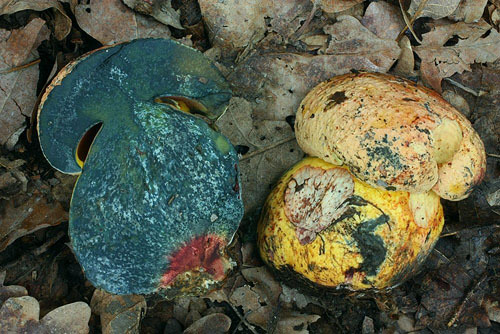 Boletus rhodoxanthus is also slightly similar; it is distinguished on the account of the less pinkish coloured unchanging on bruising cap and its yellow flesh which blues mostly in the cap and remains unchanged in the stipe. 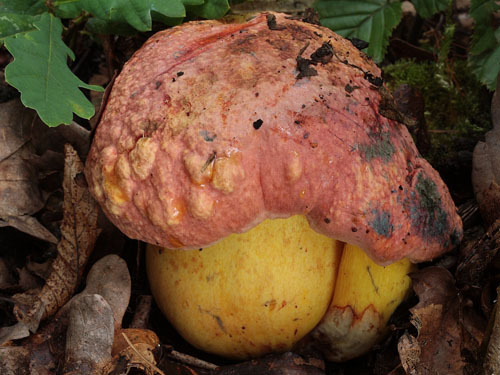 Compare also with Boletus satanas, although the later usually has different cap colour, which is not changing when bruised. Note. 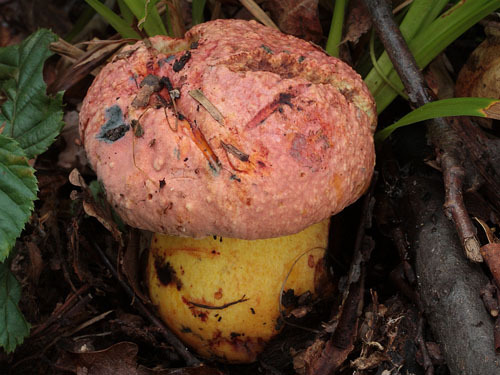 In the past the name Boletus purpureus was often used for this species, but it has been also applied to other similar boletes with pinkish caps. 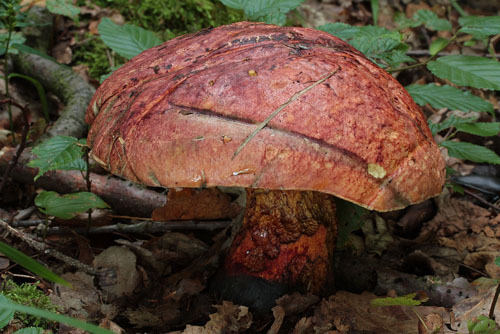 This has led to much confusion in the application of this name and it should not be used for any bolete. Redeuilh, G. 1992. 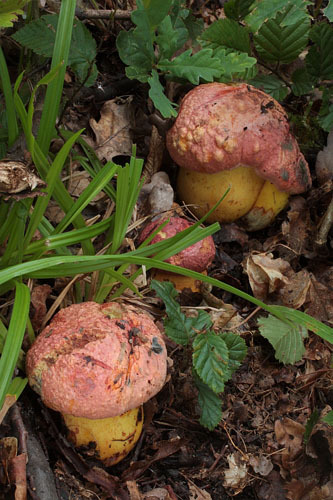 Contribution à l’étude des Bolets II, Etude critique de Boletus rhodopurpureus Smotl. 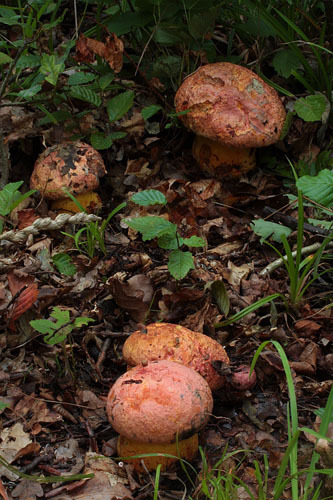 – Bulletin Trimestriel de la Société Mycologique de France 108: 87–100.